I picked this book because when I went to see Martin Salisbury he recommended this book as it’s a good book to understand the key features of a comic book. This book took 15 months to make and has been on the back burner for 9 months, thats a long time! From opening onto the first couple of pages it’s amazing how detailed it is and exciting because there is a fair amount of text but because it’s in comic form it’s more fun to read. I haven’t read all of it as I don’t have time but there are sections that I will point out which I thought were good. 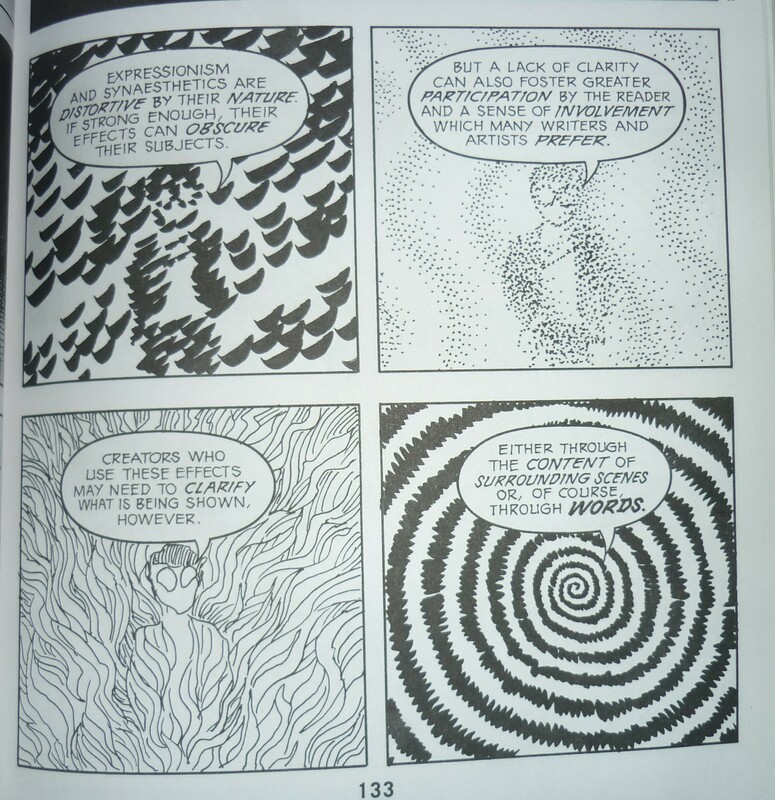 Comics can be based on any themes and they are in sequential pattern. 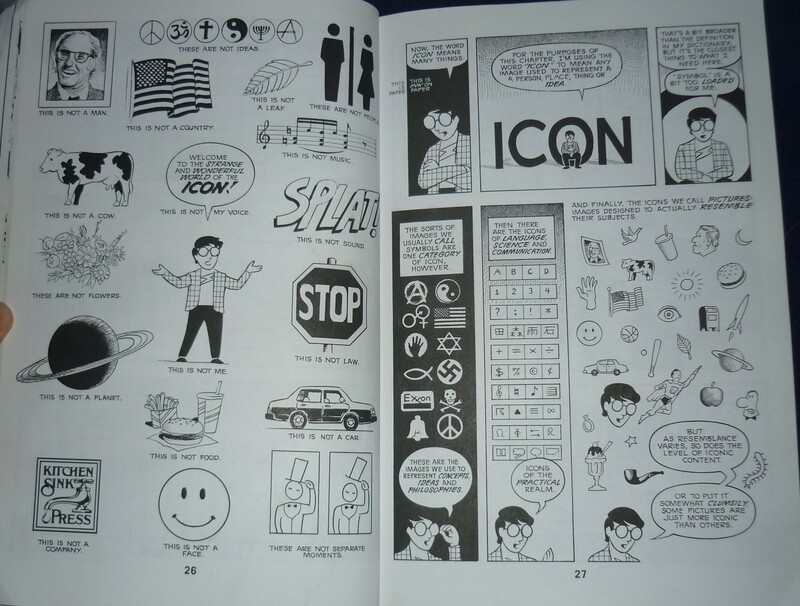 They can also include icons meaning an image to represent a person, place or thing. Closure – closure is when we fill in the gaps, for example if there is an image of a person with the legs out of the frame, the reader would automatically fill in the gap and give them legs. Showing movement – how can you show movement in images that are still? 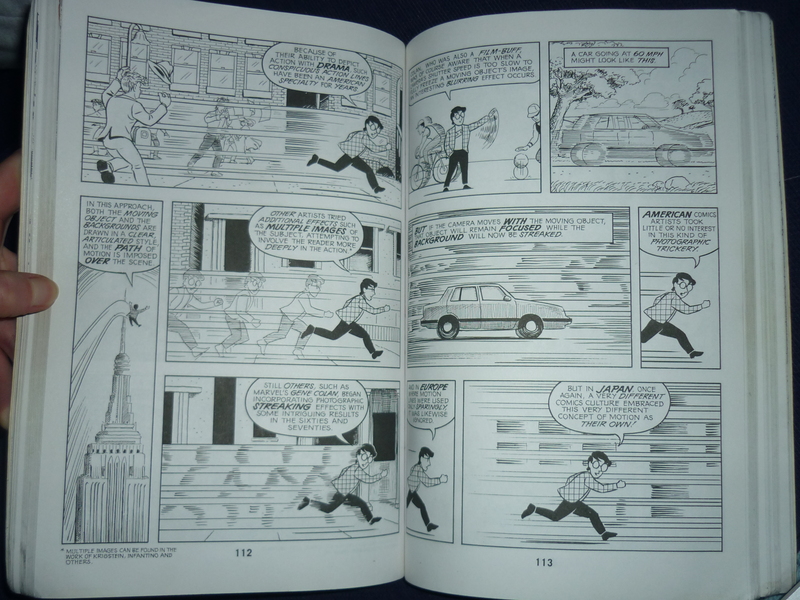 Comics uses motion lines or zip ribbons. They have been developed and refined over time and have even become a style. See artists Bill Everett and Jack Kirby who have developed these lines into a type of drawing style and is very popular in American comic books. In different countries they have different styles, in Japan they use a technique where the “camera” follows the moving object whilst the background is whizzing past. In Europe they use the lines or multiple images to make them look like they are travelling in speed as seen below. 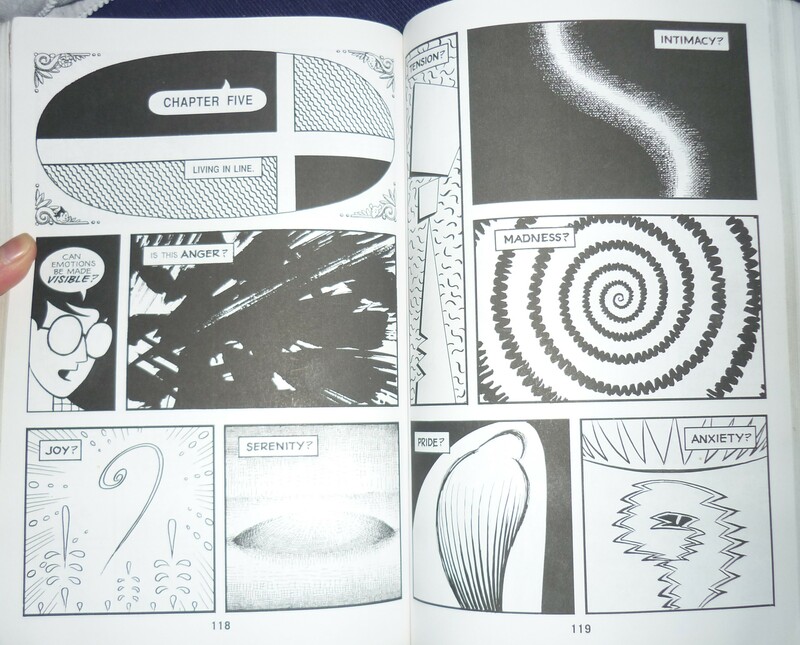 In one chapter it talks about how emotion can be shown through comics. This is particular interesting to me as I am trying to show the emotion frustration through my work. Paul Klee said ‘Art does not reproduce the visible: rather it makes it visible’ meaning it brings certain hints to the readers attention. It says if colour can show emotions e.g blue calming and red is passion then why can’t lines express emotions – this is what I have been experimenting in my own work with scribbly lines suggesting frustration. Lines can be the same style but when put within a scene it can change the definition of this lines for example this scene from the book. Mark making can be just as important, the image above shows how lines can show different emotions too. So when applying this to my work I will consider using different lines to express the emotion or feeling I want the reader to feel. However, colour tends to be the dominant source to express moods, depth or a central role. 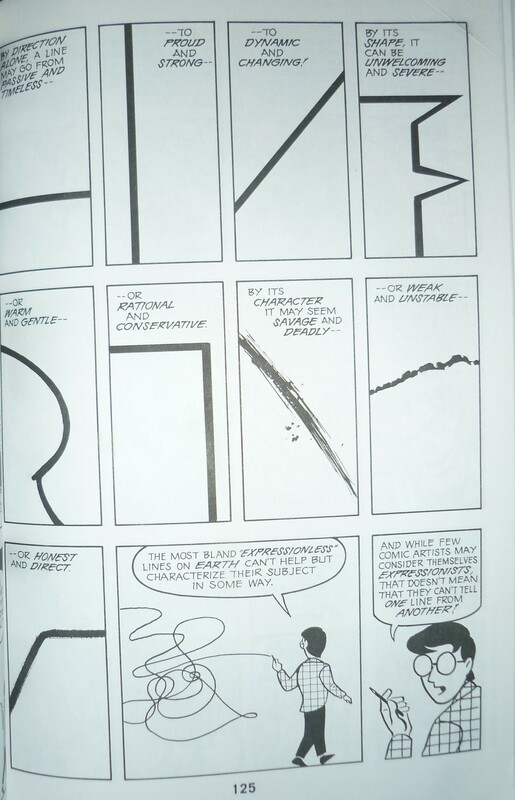 In comic books symbols and shapes can also express different emotions the character may be experiencing. These are a few examples McCloud shows. The book talks about the balance between word and picture, McCloud comments how they don’t always have to be balanced as words can speak for images or cement the meaning of the image or the image can explain more than words can. But an image can also allow the words to explore, an image can suggest what is going on but the words can be independent or ruminate on a broader topic. I have only scratched the surface of this book, there is a lot more to it and it is really fun to reads. I would recommend it to anyone even if they aren’t in the drawing business. I will refer back to this book in the future to explain my theories and explain why I created certain bits of work/ dissertation. 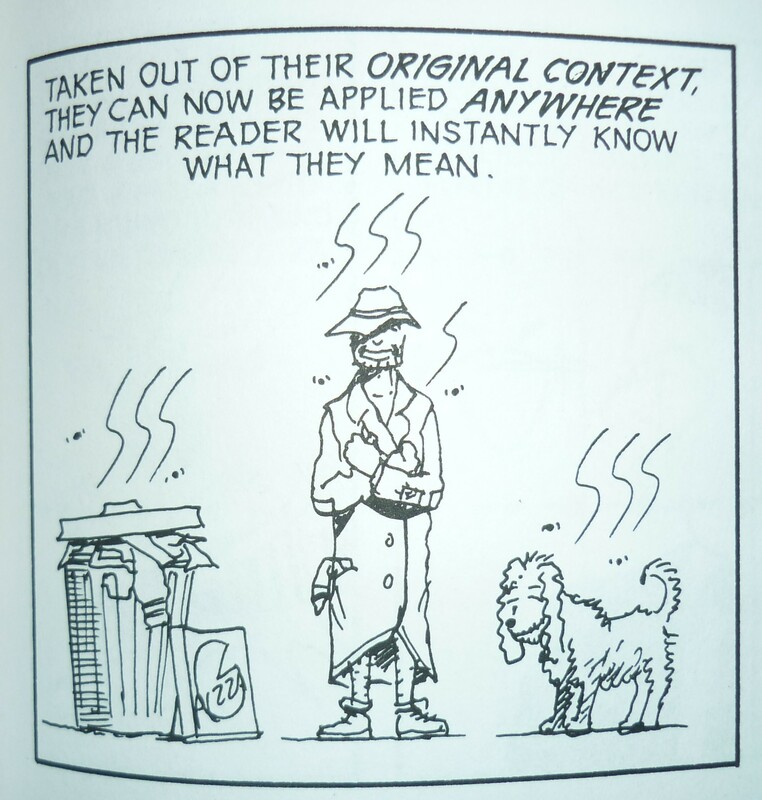 McCloud, S., 1993, Understanding Comics, The Invisible Art. New York: Harper Perennial. 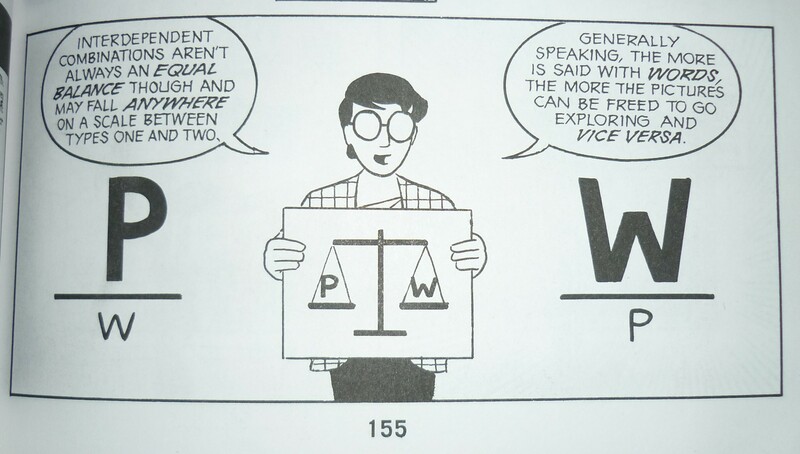 This entry was posted in Understanding Comics - Scott McCloud -review.